We left Prince George and headed towards Jasper. While the sky was slightly hazy from the forest fires over 500 miles away, the majestic beauty of the Canadian Rockies was clear. 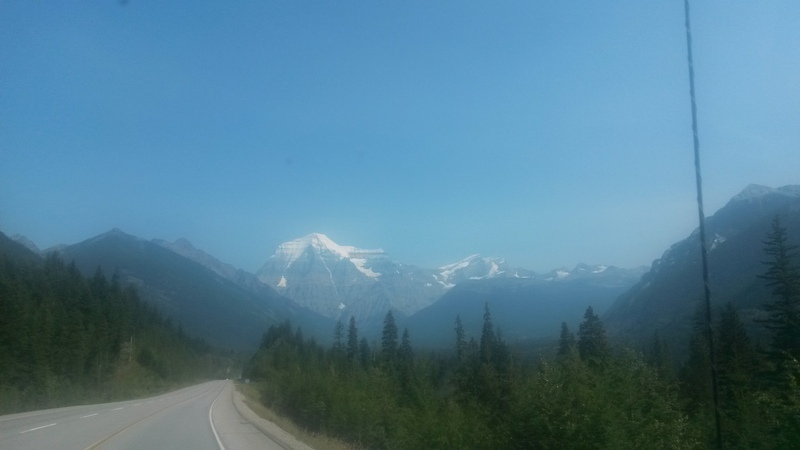 Mount Robson, on the BC – Alberta border is an impressive chuck of rock that is the gateway to the Parks along the range. 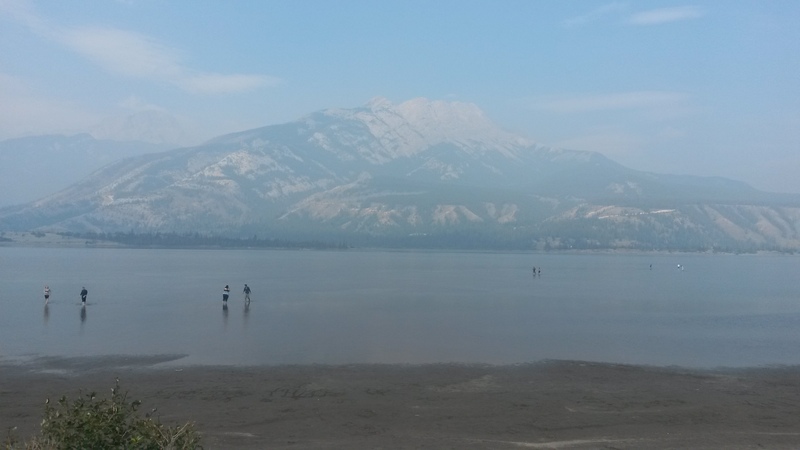 By the time we got to Jasper, the smoke was thicker and very noticeable, capping the taller mountains from view. 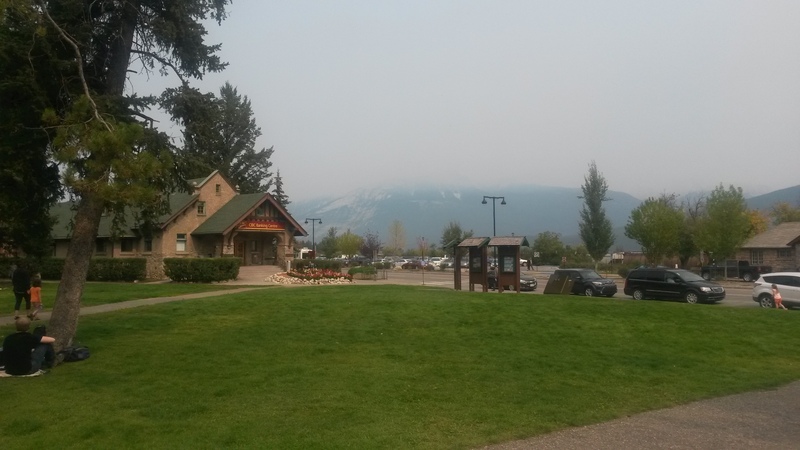 Since the smoke was coming from the southwest direction, we headed northeast to the upper corner of Jasper park. We camped at the Pocohontas campsite, which was just down the road from the Miette Hotsprings. We started our day relaxing in the hot springs before heading out to explore. We saw a rather plump black bear on the road up to the springs. That bear was definitely going to sleep a long time this winter. As we dropped south towards Jasper again, the smoke was not as heavy as the previous day, but still evident. Jasper Lake was along the way and is a very shallow lake. Folks were out there quite a ways and only to their knees in water. We were lucky enough to catch these guys right by the side of the road. The last one decided to give Pam and the Roamer a stare-down for her last shot. 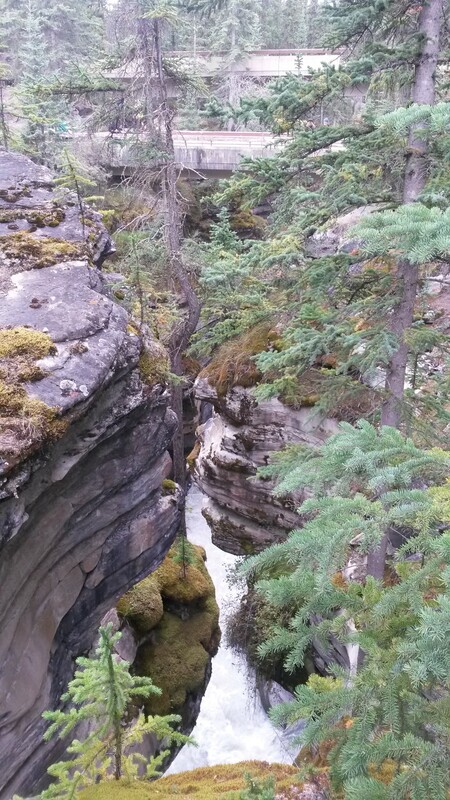 We hiked Maligne Canyon, where the water has cut a very interesting path through the limestone. 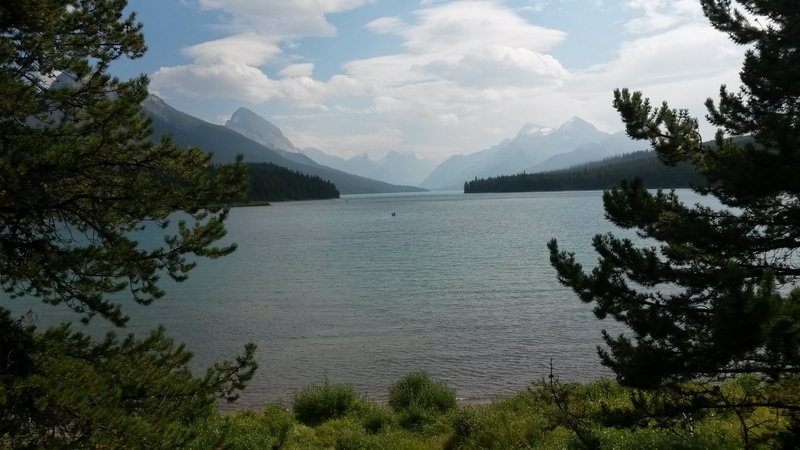 Maligne Lake looked like a postcard with the trees and mountains. It rained off and on during the day, which helped to clear the smoke out of the air. 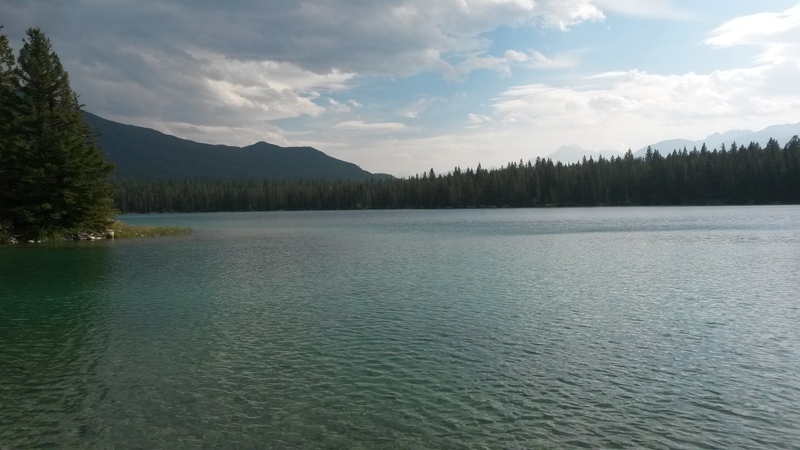 This was a picture of Annette Lake, just outside Jasper, which we visited on my Mom’s birthday. 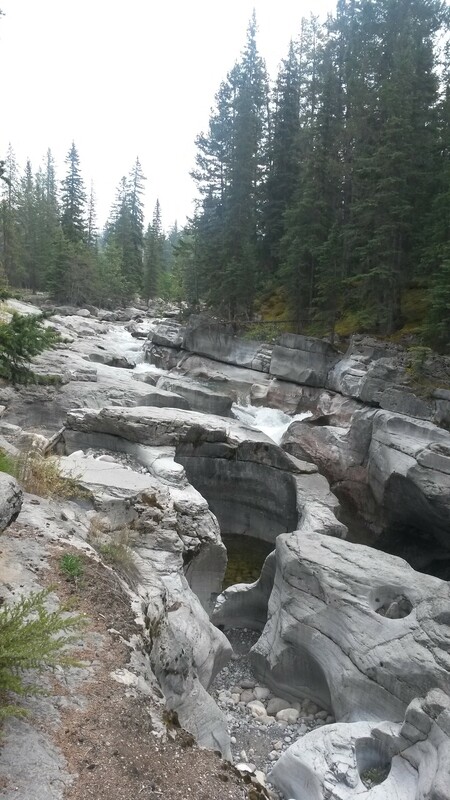 We camped at Whistler campground, just outside Jasper, and began our falls exploration the next day. 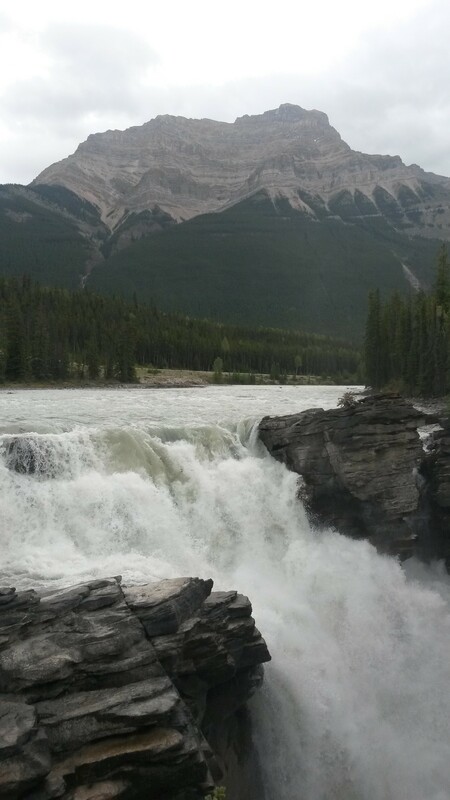 The first falls we visited was the Athabasca Falls. It too cut a beautiful path through some limestone down to a lower river segment. 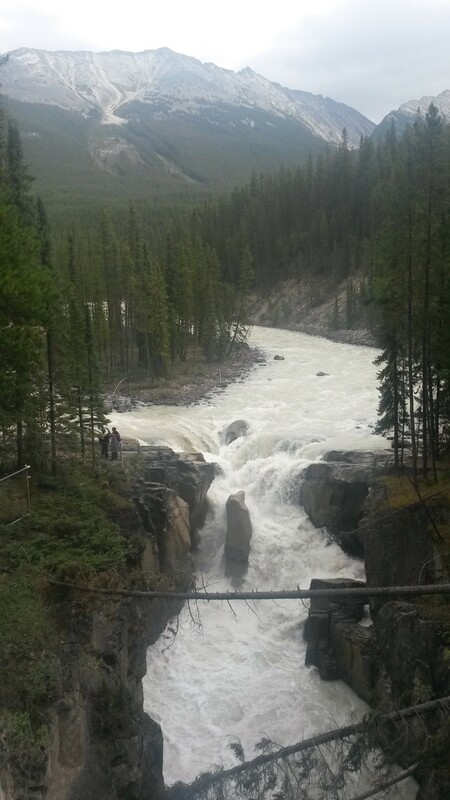 The next set of falls were the upper and lower Sunwapta Falls. They were separated by a nice hike through the forest. 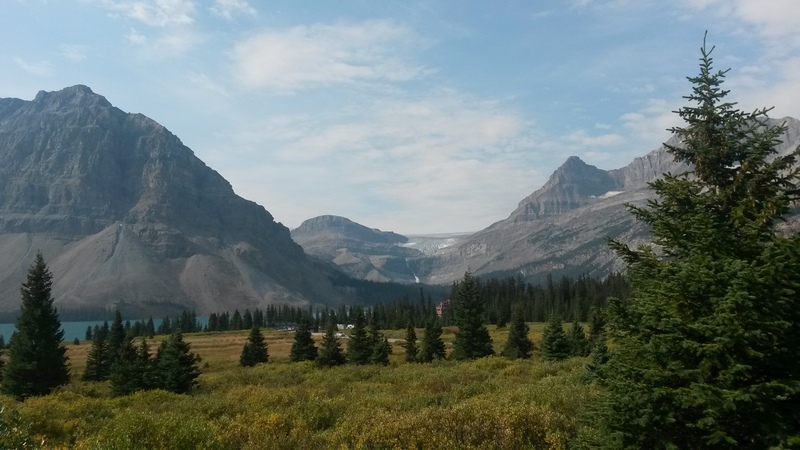 As we continued south we hit the Columbia Icefield, which is the dividing line between the Jasper and Banff Parks. 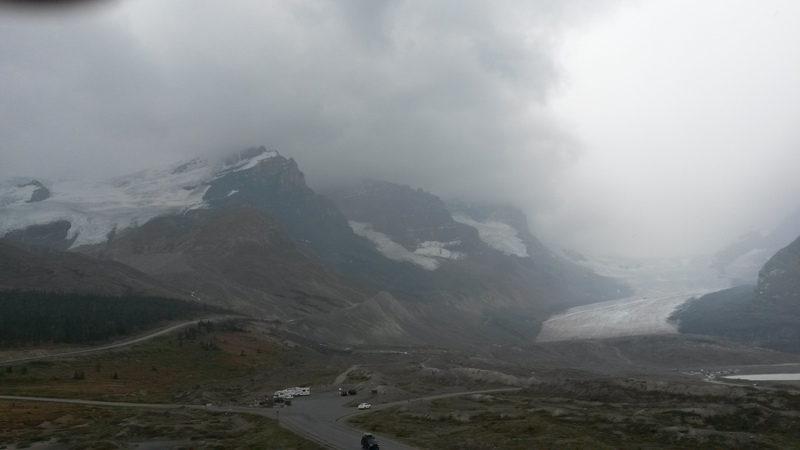 The weather had moved in about this time and most of the icefield was hidden in the clouds. The big attraction there was to ride a bus up onto the glacier and walk around. While the visitor center was a very nice building, it was packed with way more people than we had seen in some time. 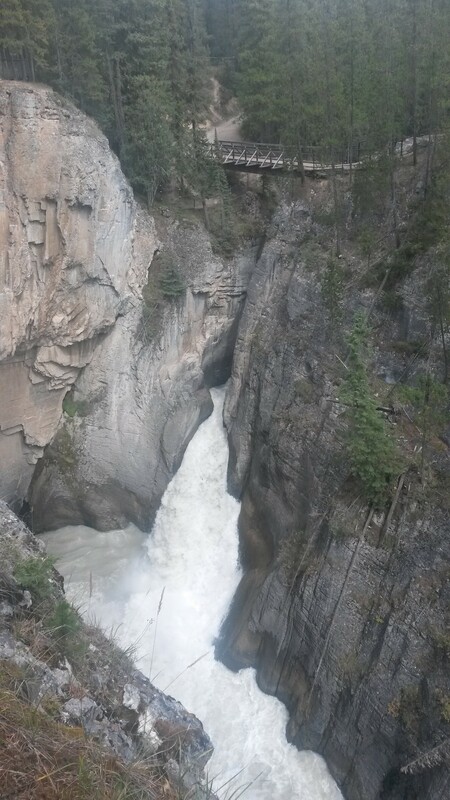 We grabbed some information on Banff, snapped a couple pictures and got out of there. 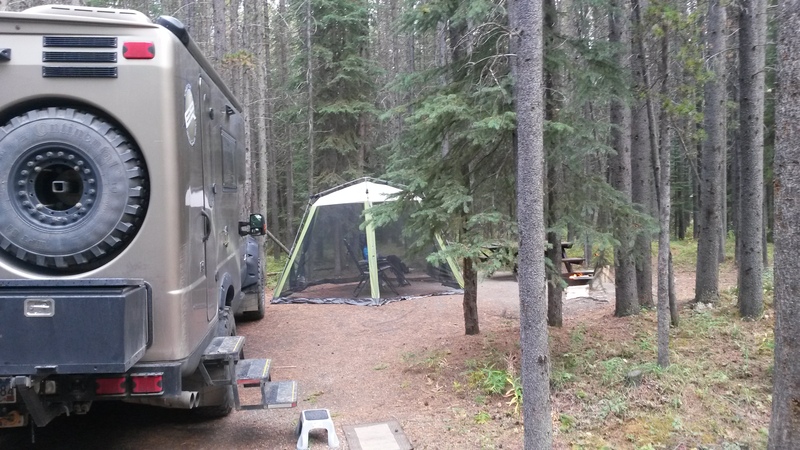 We camped in the Waterfowl campground in the Banff Park. While we had not needed to use our insect room for the entire Alaska and Yukon segments of the trip, we set it up here as the perfect drizzle canopy to enjoy our evening fire in the light rain. The panoramic views during our drive were just amazing. We had some vistas that were during the rain and later on during periods of sun as we made our way through the park. 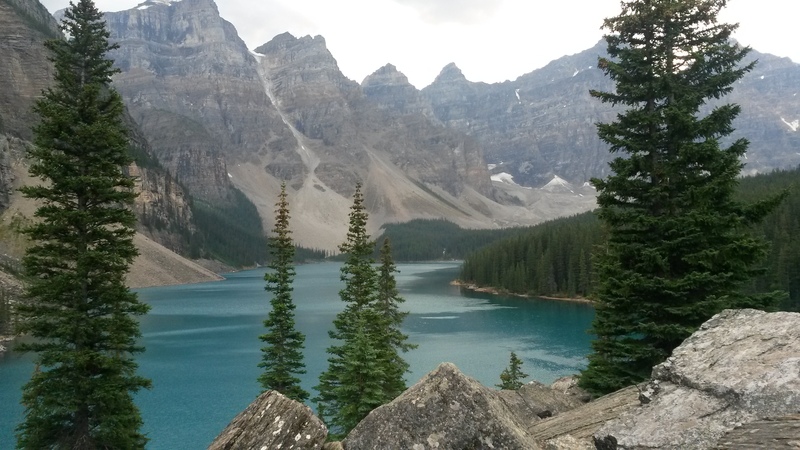 We attempted to go to Moraine Lake during lunchtime on a Saturday. We never made it due to the number of people and the lack of parking near the lake. We were turned around by the traffic control guys and pulled off the side of the road to have lunch just down the road from the lake. 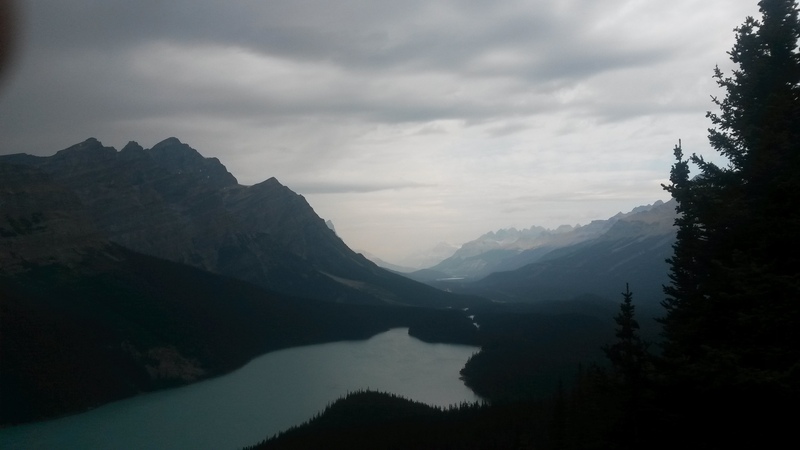 There were signs that said it would be difficult to find a place to park between 10am and 4pm at either Moraine Lake or Lake Louise so we instead found a campsite at Castle Mountain campground, had an early dinner and then headed back to the lakes at 6pm. Parking was available in the evening and Moraine Lake was beautiful. 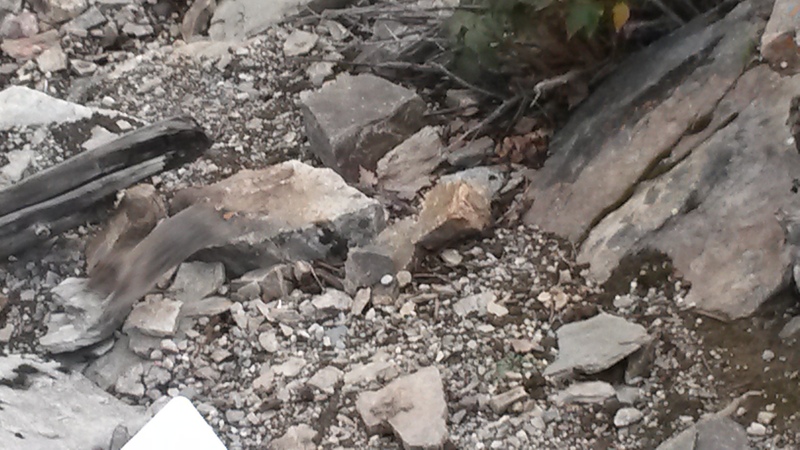 We heard a Pika (sounds like a squeak toy and is related to the rabbit family) in the rocks but couldn’t see it. 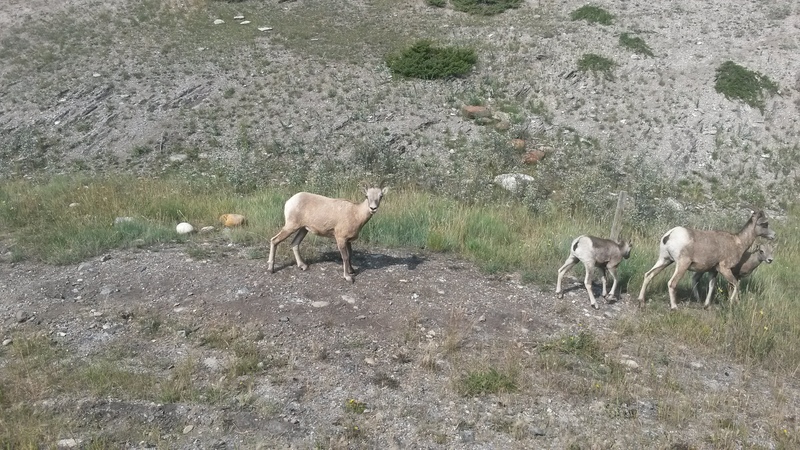 As we were hiking out, it popped out of the rocks about a foot away from us with some flowers in its mouth for its den. It scampered through the rocks into its den and then popped out again to follow us down the rocks. I tried to get a picture of it, but he was too quick and all I got was his blur dashing across the rocks. 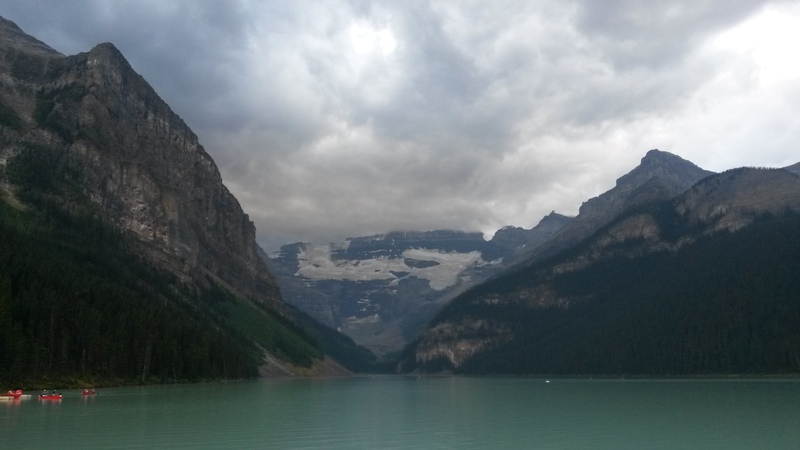 After Moraine Lake, we visited Lake Louise as the sun was setting and the weather rolled back in. It was beautiful but it does attract many people. The hotel there will have to be a future trip sometime (until we see the rate to stay there – lol). 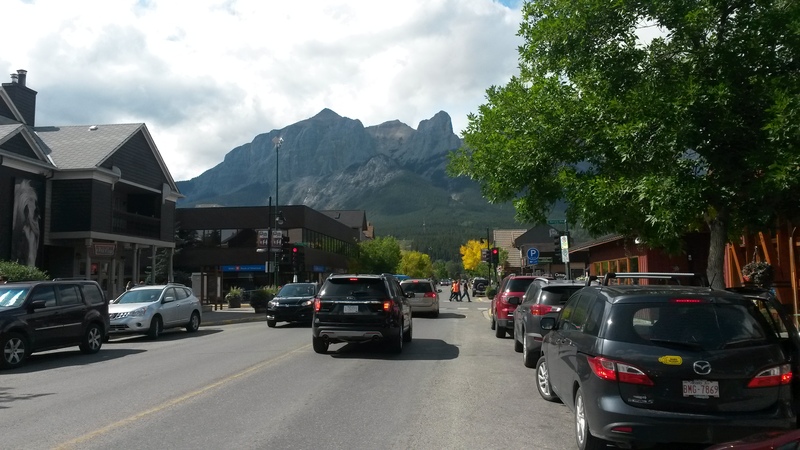 We attempted to visit the town of Banff, but that was a joke. The small town was packed and attempting to find a legal place to park the Roamer anywhere close to town was impossible. 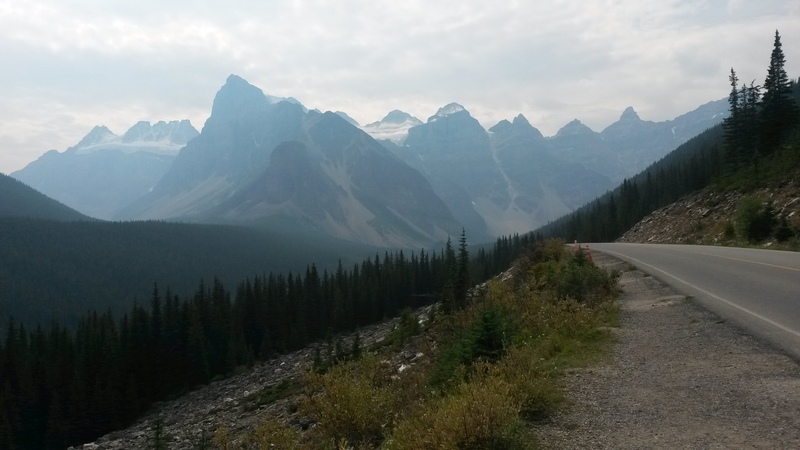 We then pointed south and left the park, stopping instead in Canmore. 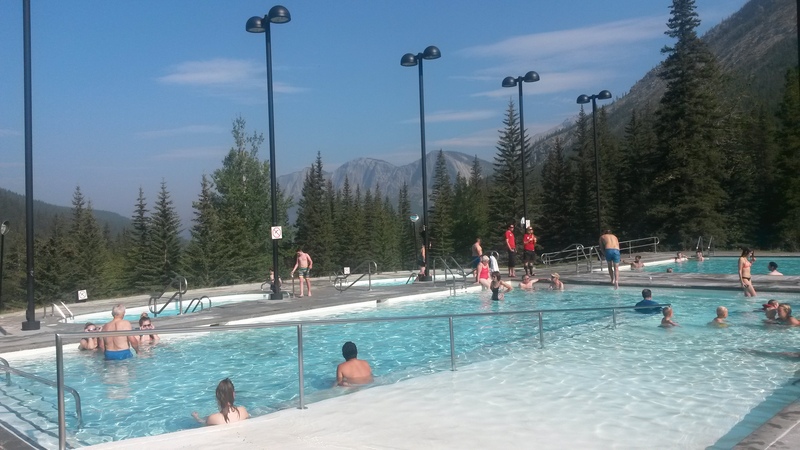 We found out later that Canmore was a sleepy little mining town until the 1988 Calgary Olympics. Many of the skiing and Nordic events were run out of Canmore. The place boomed but was way more accessible compared to Banff. 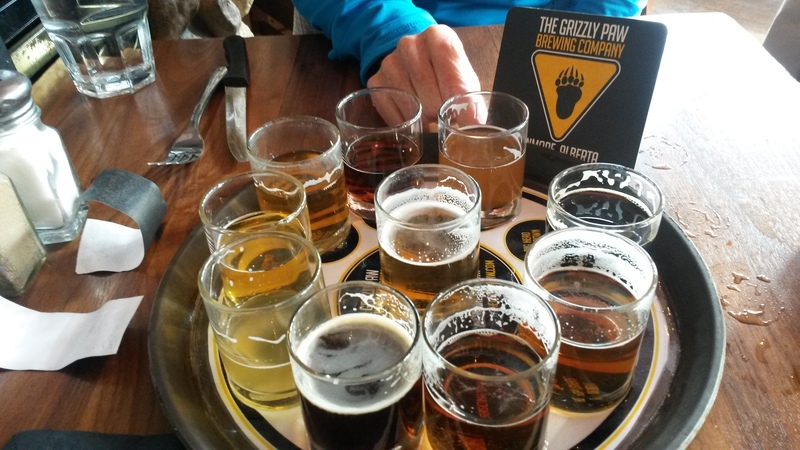 We stopped and visited the Grizzly Paw Brewing Company for an awesome lunch and a flight of their really good beers. That wrapped up the Jasper – Banff adventure. There were many more hikes and things to see further off the main route, so we’ll be back.